Leveraging the vast hands-on experience of ecommerce platform development, Iflexion helps Sleepers in Seattle improve customer service and skyrocket sales. 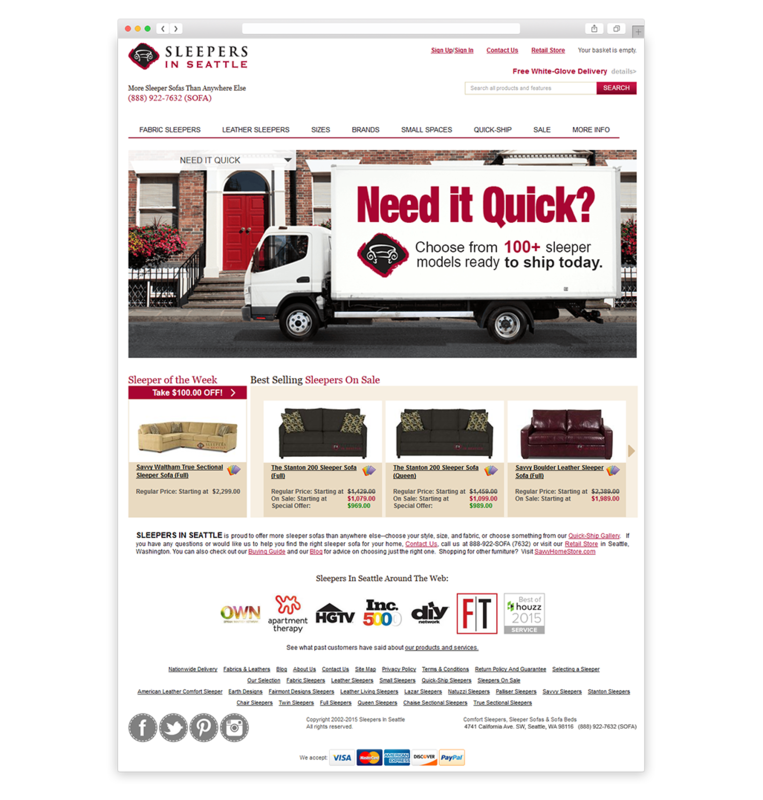 Our Customer is Sleepers in Seattle – a prosperous furniture store based in California. Since 1991, the company has been designing and distributing ready-to-assemble furniture and accessories via different channels, including the web. At one point, the Customer realized their legacy static website was not enough for efficient sales. Sleepers in Seattle needed an ecommerce web application with advanced features addressing the needs of the most exacting online buyers. The company wanted to stand out from online competition by ensuring unparalleled shopping experience for the customers in search of a perfectly fitting sofa bed. To address the challenge, our team supplemented the existing .NET-based ecommerce platform with another dynamic website, the two sites sharing a single database and admin area. A single system back-office stood for a shared product stock, order processing system, user base, and statistics on sales, which, in turn, was designed to reach out to a wider audience, while facilitating operations of back-office administrators. In the course of ecommerce development, Iflexion’s team delivered two ecommerce websites: Sleepersinseattle.com and Savvyhomestore.com. Both online stores provide versatile opportunities to both end users and system administrators. Design center. This is the website area where buyers can customize the selected sofa and see what their sleeper will look like in any of the available colors and upholsteries. Advanced catalog search. The Quick Search feature enables prompt searching by all products and features, while Furniture Finder allows customers to sort the list of selected items by several criteria at a time (price range/brand/dimensions/product category/etc.). Shopping on the go. Both websites are optimized for tablets and mobile devices. Cross-device testing was carried out to determine what changes need to be introduced to ensure those who use their mobile devices to navigate Sleepersinseattle.com or Savvyhomestore.com shop with the utmost comfort. Administrators can manage homepage widgets, process and track orders, manage products and customers, launch and track marketing campaigns. Rich data analytics features allow them to gather statistics and create reports on the two dynamic websites from a single admin interface through powerful and easy-to-use dashboards. When a customer makes an order, an administrator receives an email notification. As soon as the admin has processed the order, the customer receives a notification of the order being shipped. To make payment processing easy for the end customers, our team integrated the ecommerce platform with PayPal and Authorize.net. To ensure security of the credit card data, the developers implemented SSL certification and Secure Checkout processes that don’t require credit card information stored. Iflexion was engaged in the project as a sole technology partner at all stages of ecommerce platform development. The Customer provided a detailed requirements list at the project initiation stage, complementing it with new ideas as the website development unfold. Iflexion was proactively managing requirements inconsistency that could compromise system flexibility, while suggesting beneficial alternatives. Based on our ecommerce development experience, we proposed moving the ASP.NET Web Forms-based solution to MVC 4 framework, as the former was increasingly difficult to scale, when it came to extending the web application with a new store. The system’s grids, controllers and listings were refactored, while the interactive admin panel UI was left unaltered, as requested by the Customer who wanted to preserve the look-and-feel they got used to. In a matter of 8 months, Sleepers in Seattle got a full-featured, easily scalable ecommerce solution. Once launched, the delivered websites started bringing tremendous profit. Implementation of the scalable ecommerce platform enabled Sleepers in Seattle to reach out to even wider audiences and increase sales volumes through decreasing the effort spent on administering the two websites, facilitating sofa selection process, and drastically improving the online shopping experience.